Last week you saw how you can simulate the heating of a car’s brake discs. This reminded me of another type of brake — the eddy current brake (also known as magnetic brake). Whereas the other model was a study in heat transfer, eddy current brakes deal with electromagnetics. As the disc spins in the constant magnetic field generated by the permanent magnet, its conductive properties induce eddy currents. 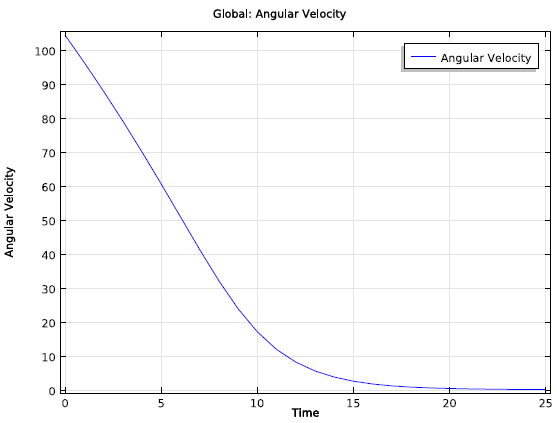 The Lorentz forces from these currents in turn slow down the disc. The most common application areas of magnetic brakes are trains, roller coasters, and aircraft. It’s not unlikely that eddy current brakes will eventually be found in cars as well. You may have also heard of electromagnetic brakes, which are similar in design, except instead of a permanent magnet they have iron wound with a coil. Let’s suppose you are designing an eddy current brake, and you want to know how large the permanent magnet needs to be in order to provide enough torque to slow down the vehicle (train, roller coaster, car…) in time. In this case we’re assuming the induced current distribution does not move with the rotating disc; it stays where the magnet is located. Note that the induced Lorentz current density term often leads to confusion when modeling electromagnetics where there are moving magnetic sources or the moving domain is of bounded extent in the same direction as the motion or varies in this direction. These types of moving sources generate magnetic flux that cannot be included in the Lorentz term. To be clear, in our case the induced current distribution is stationary and does not move with the disc. Let’s assume you have a copper disc that’s 1 cm thick, has a radius of 10 cm, and moves at an initial angular speed of 1,000 rpm. 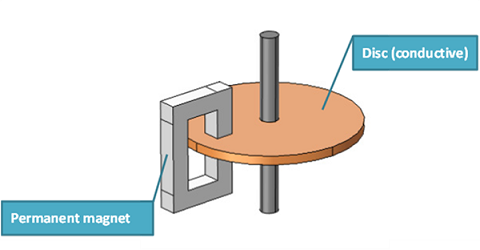 The 1 T permanent magnet is connected via an iron yoke, and there’s a 1.5 cm gap of air where the disc can spin. 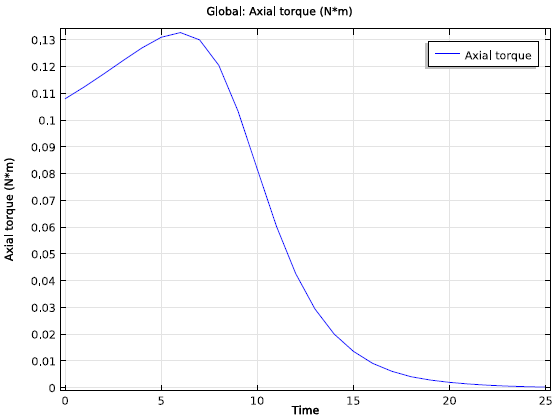 Using COMSOL Multiphysics and the AC/DC Module, you can figure out how much torque your brake system will have. What’s notable is that you can include the rotation of the device without having a moving mesh. 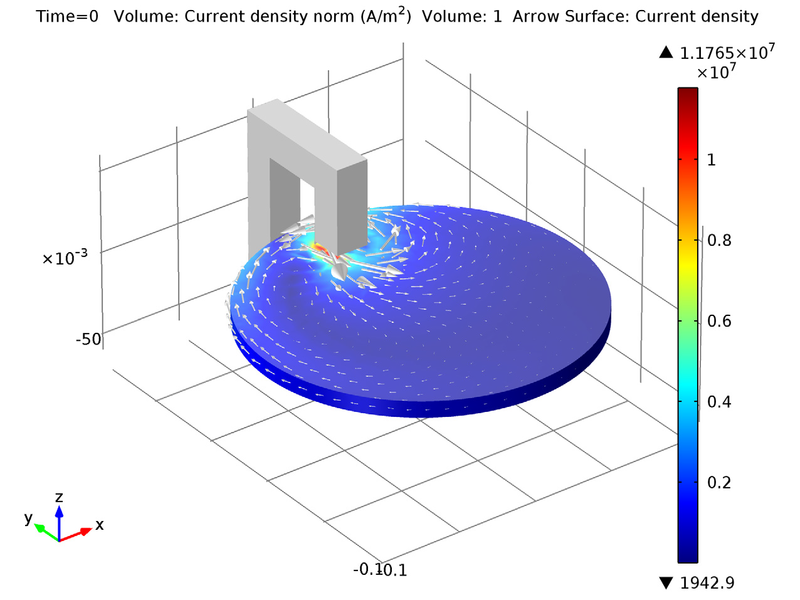 The magnetic brake model couples a dynamic equation (this defines the rotation of the disc) with the finite element method (this defines the torque). 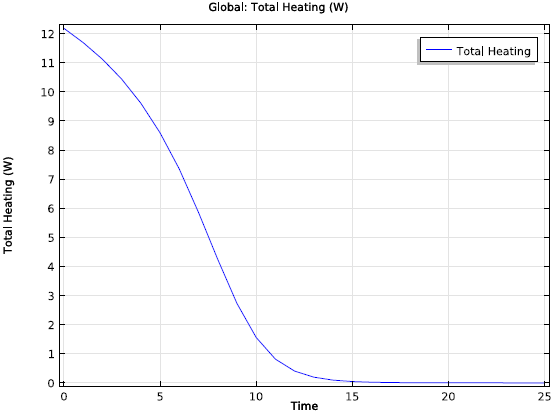 This will allow you to calculate the total time to completely brake the system. 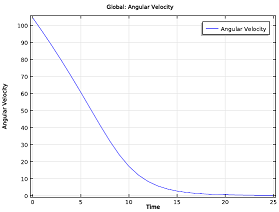 3D model showing induced eddy current density and direction at t=0 s. 3D model showing induced eddy current density and direction at t=25 s.
Time evolution of the angular velocity. 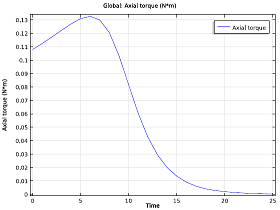 Time evolution of the braking torque. 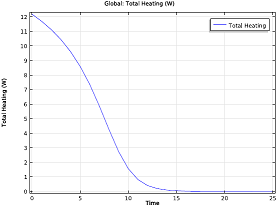 Time evolution of the dissipated power.